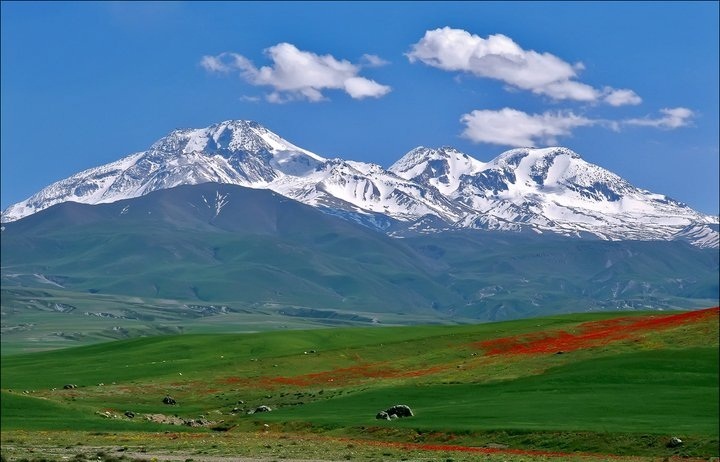 Located in the extreme northwest of Iran, Savalan is the country’s third highest peak after Damavand and Alam-Kuh. It is also higher than Mont Blanc in the Alps. The mountain offers many attractions throughout the year. On the slopes of the mountain the mineral water from springs attracts large numbers of tourists each year, many of whom have faith in healing properties attributed to the springs. The nomadic people of the area live in small villages, with their round “Yurt” tents appealing to tourism. Savalan has a ski resort (Alvares) and different tourist areas such as the Sarein spa. The mountain is known for its beautiful vistas, including the Shirvan gorge, where few climbers ever venture. According to some beliefs, Mount Savalan was the place where Zoroaster meditated for some years, so Mt. Savalan is one of the important sacred places in Zoroastrianism. Based on nomadic beliefs, when all the snow of Savalan melts, the end of time will come. Savalan is a large andesite stratovolcano in Meshgin Shahr (Khiyav), in Iranian Azerbaijan in North West Iran. It is the second highest volcano after Mount Damavand. The volcano is quite old. Its first eruptions occurred in the Eocene and later in the Miocene. But the main volcanism happened in the Pliocene and the Pleistocene as some of its rocks have been dated to 5–1.4 million years. Some references state that volcanic activity continued into the Holocene, less than 10,000 years ago. The summit region has several peaks exceeding 4,500 meters (14,800 ft), primarily along a southwest-northeast trending ridge. The highest point 4,811 meters (15,784 ft) is at the northeast end of the ridge, and is separated from the 4,620 meters (15,160 ft)+ group of southwestern summits by a 4,190 m (13,750 ft) col. The mountain is located in a continental climate with hot, dry summers and extremely cold, snowy winters. Precipitation falls primarily as snow in late autumn, winter, and spring, and is sufficient to sustain seven glaciers near the summit above 4,000 meters (13,000 ft). The largest of these were more than 1.5 kilometers (1 mi) in length as of the 1970s. There are also extensive rock glaciers, several of which are more than 3 km (2 mi) in length. The climbing surface includes rocks of various sizes (Class 2 scrambling), and a moderate degree of fitness is required to climb it. The climb from the base camp starts easy, becomes challenging mid way, then eases in gradient near the top. The lake on the top remains frozen except for about four weeks in late July to early August. Some climbers start by driving to hot springs of Meshgin Shahr, where they start their climb. This climb takes about two days, reaching to the base camp on the first day. Others take a taxi to base camp early in the morning, and climb the mountain in one day. In 2006, there was talk of improving the road to the base camp. If this is done, a regular car should be able to make it to the base camp during the climbing season. The road goes through multiple nomadic encampments of shepherds. One or two days of acclimatization in Tehran or Ardabil may be advisable. Mountaineering has been popular among the youth in Iran. On a Friday during the climbing season (late June to mid August), one may find hundreds of people on the mountain. Guides can also be found in Ardabil. Adequate climbing equipment can be purchased in Ardabil or Tehran. The area around Savalan, particularly near Meshkin and Mughan Plaine, produces large quantities of grain, including wheat. Due to the microclimate produced by the mountain, Ardabil remains pleasantly cool in the summers. There are numerous hot springs around the slopes of Savalan, with a main concentration within Sareyn County. There are skiing slopes, with snow even in near-summer. A ski resort named “Alvares” is within an hour’s drive from Sareyn on the south ridge of Savalan.